First elected to the governorship of Connecticut in 1958, Buckingham was an established Republican Party candidate. Also, having once met President Lincoln, he was a staunch supporter of the war effort. In 1861, he helped put together the first three-year regiment, the 4th Connecticut Volunteers (Charles Goodyear joined company I). 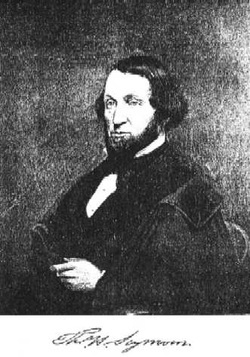 He had been involved in CT politics since 1849 when he was elected the mayor of Norwich. While Governor Buckingham essentially ran on the platform of pro-war, Seymour ran as a Democrat opposed to the war. He had been the 36th governor of Connecticut from 1850 until 1853 when he was offered the position of minister to Russia by then President Franklin Pierce. He ran against Buckingham in the 1860 election, and lost by only 541 votes. This was his second attempt to retake the governorship. Buckingham won by a margin greater than 50%, clearly indicating Connecticut's continued support of the Civil War. Connecticut's election was the only state among the Northeast where the "peace issue" was of great importance and in the forefront of the election. There was some worry because so many men were away in the war, the Democratic Seymour would win because their vote would be lost. As Charles' letter would indicate, the soldiers were not excluded from the vote. The vote also helped to show that while support of the war was waning, the general consensus was that the war was still necessary. Also, by 1863, the North was finally beginning to win some much-needed victories, especially in the West which likely helped to re-energize the voters. If Connecticut had voted for Seymour, little would have changed on the national level, as Connecticut only had four representatives in the House of Representatives. Also, it would not have affected other elections within the Northeast. However, the impact would have been to the morale of troops and supporters of the war. Going into the Presidential election, a change in Connecticut's support could have been seen as a rallying point for the Democratic Party.